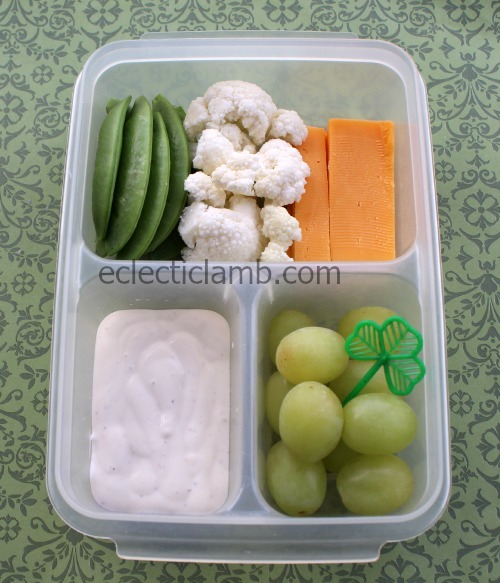 Last year I shared 7 St. Patrick’s Day lunches including some old ones. 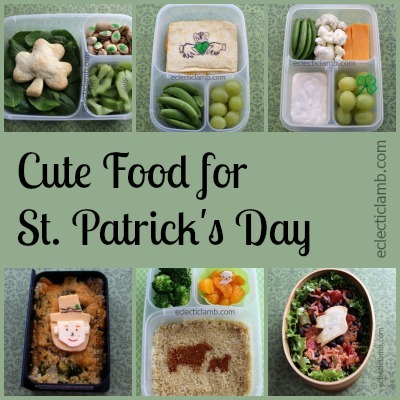 This year I created new cute food for St. Patrick’s Day. I love making cute shaped food for any holiday or occasion. 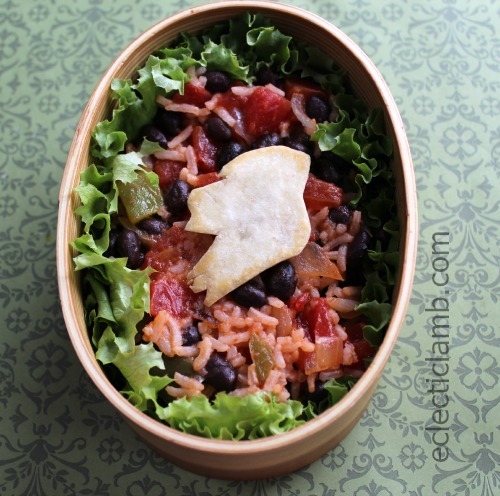 This food includes a shamrock, Claddagh ring, Irish flag, Leprechaun, sheep, and a tortilla chip in the shape of Ireland. This was a simple but satisfying meal to make and eat. I made the hand-pie with pie crust, a shamrock cookie cutter, cooked broccoli and cheese. Recently I have enjoyed garnishing with cheese art. I made a mermaid, fox head and now this leprechaun. I was inspired by this coloring page. My leprechaun has a deep wrinkle on his face (crack in the cheese) but I think that it adds to his character. I am not sure how successful this is but I tried to make a Ireland country shaped tortilla chip to top this Mexican rice meal. Contents: Lettuce, rice, black beans, tomatoes, onion, cheddar cheese, tortilla cut in the shape of Ireland and browned in a frying pan with cooking spray. When brainstorming new Ireland / St. Patrick’s day themes to try this year, I remembered the Claddagh ring. The fingers turned out a little strange but I still like it. 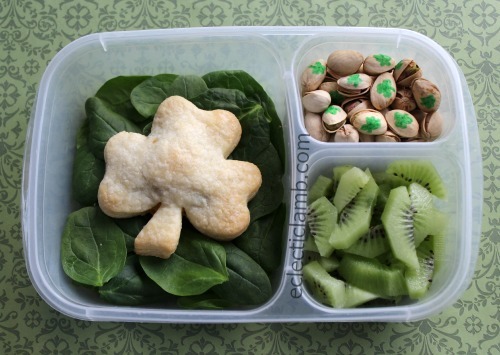 I made this little Irish flag themed snack for my husband. I wanted it to be different than this Irish Flag so we came up with different food he would eat in green, white, and orange. 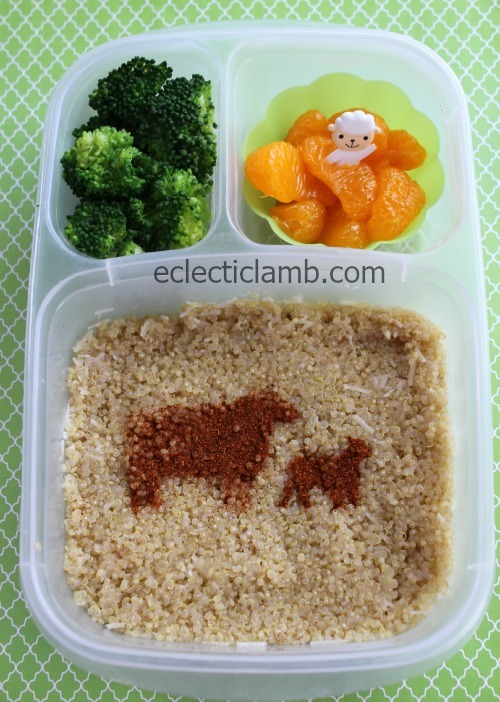 The stencil is supposed to be a sheep and her lamb. What are you making for St. Patrick’s day this year? 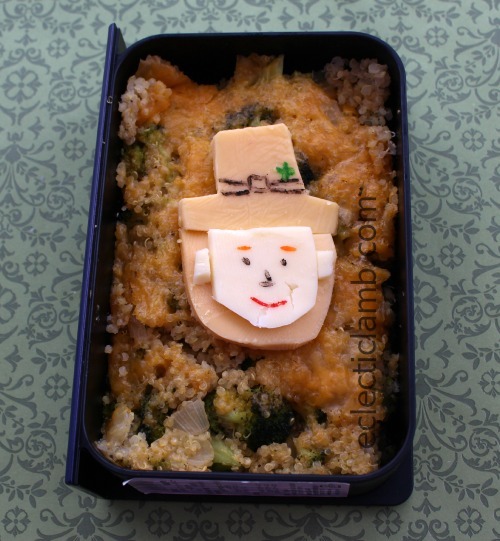 This entry was posted in Bento / Cute Food, Food and tagged bento, lamb, sheep, St. Patrick's day. Bookmark the permalink. 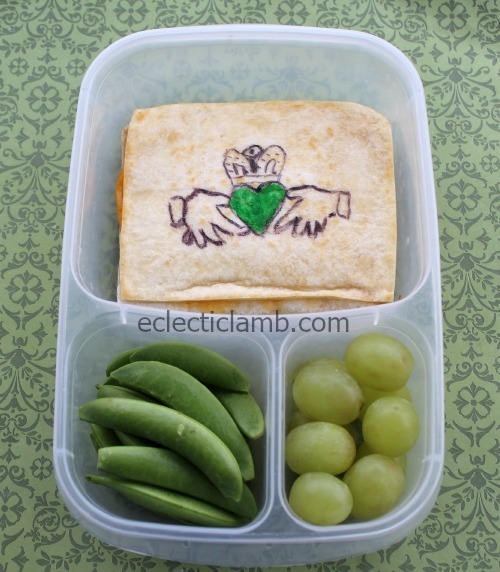 Such clever lunches- I love them all! These are adorable! Can’t wait to see more this year!